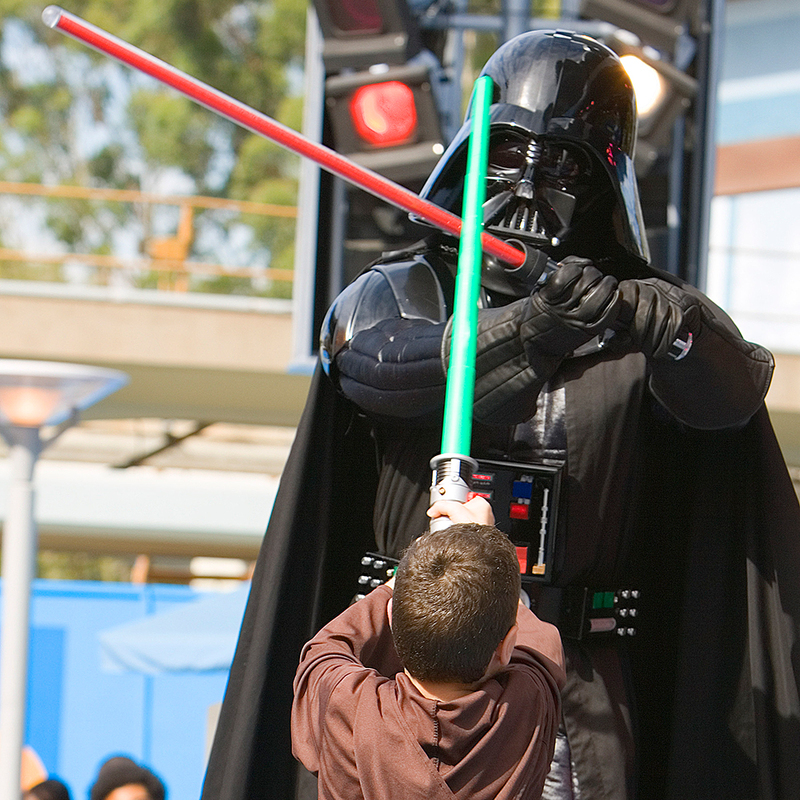 When news first broke in 2012 that the Walt Disney Company had bought Lucasflims – the entire Star Wars universe included – fans immediately began debating just how Disney’s involvement might affect the Star Wars franchise moving forward. By most measures, since the release of The Force Awakens and Rogue One, the movies seem to be in good hands. So maybe we were asking the wrong question: Instead, maybe we should have been discussing how the Star Wars franchise might affect Disney? Specifically, the churros. In what may be the greatest merger of Star Wars and Disney to date, Disneyland in California has started selling lightsaber churros, according to Pop Sugar. Though the initial thought of lightsabers and churros merging into one creates a sense of utter joy, on first glance the execution is admittedly a bit hokey. Basically, Disneyland’s staple doughy sticks have been dyed lightsaber colors – blue or red – and then had one end stuffed inside a small cardboard holder that’s designed to look like the base of a lightsaber. But upon further reflection, the idea and execution encompasses a level of Zen-like simplicity that leaves you wondering why we’re only hearing about this amazing invention now. As if these churros weren’t already an irresistible impulse buy, the sweet dough sticks are reportedly being hawked via a churro cart positioned right outside of Disneyland’s Star Tours ride – meaning visitors are being caught during a heightened level of Star Wars excitement. And as an extra enticement, they’re also covered with edible glitter and tiny, shiny stars. I can only imagine in some countries with more stringent laws, these sorts of sales tactics would be considered illegal. Dark side or light side? For me, both sides... Have you tried the red & blue churros at #disneyland yet? You can find them the churro cart outside of Star Tours. They are so pretty & delicious too! No added flavor just beautiful celestial sugar by @bakerybling! Look at the tiny stars!!! So fun. Swipe for close ups! If you can’t get to Disneyland anytime soon, pics of the sweet Star Wars treats have – as would be expected – already began to flood Instagram. Maybe if you can conjure the Force strongly enough, you can pull a Jedi-like maneuver of having one fly directly into your hand.